Bosses have a profound impact on their employees’ work-lives and their careers. Not to mention their employer’s bottom-line (think turnover). 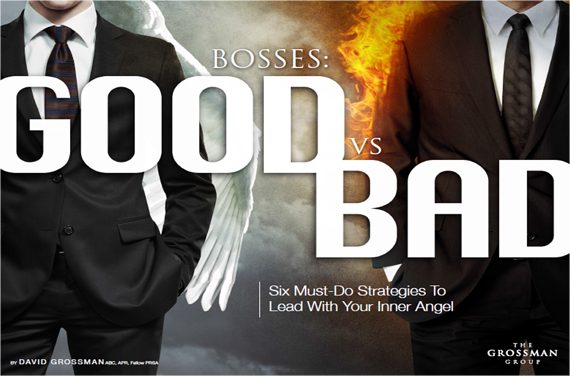 It’s with that leadership expert David Grossman developed the eBook, Bosses: Good vs. Bad, 6 Strategies to Lead With Your Inner Angel. It’s time for bosses to lead for good and not evil. Download the new eBook, Bosses: Good vs. Bad and get 6 must-do strategies for bosses to lead better. Fill out the form to the right and get Bosses: Good vs. Bad, today!